HOME > tecnical and scientific research of . . . 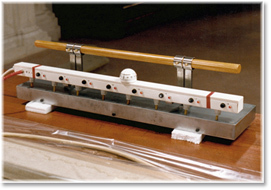 The Studio has conducted scientific research ever since its establishment, at first to understand and test the restoration materials and techniques commonly used in laboratories. That knowledge gave rise to the desire to improve the standard methods and to seek other innovative restoration techniques to help solve the growing problems of conservation of artworks increasingly exposed to degradation processes. a) Construction of a patented computerized apparatus for the controlled supply of heat in relining irons, heated spatulas, etc. With this instrument, we can operate in a stable manner in all working conditions starting from temperatures of 40°C. Restoration interventions involving heat applications can even be used on very temperature-sensitive paintings. The hot table can be replaced in most consolidation work; in fact, our apparatus allows us to intervene effectively on large paintings which would not fit into even the biggest hot tables. Moreover; we can apply strip lining to the painting, in place of a full lining, applying heat only locally to the edges of the original canvases and not to the entire work, as with the hot table. 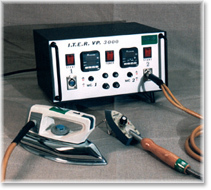 Computerized temperature control unit and large relining iron able to substitute the hot table. FEATURES: (a) M. Verdelli, N. Presenti, M. Goretti, Il controllo delle temperature nel restauro delle opere d'arte: metodiche ed innovazioni tecniche, KERMES, 25, 1996. L. Speranza, M. Verdelli, N. Presenti, Moderne tecniche nelle foderature trasparenti dei dipinti, KERMES, 46, 2002.
b) Creation of a new air extraction system for a vacuum system, like the envelope, applied to paintings on both canvas and wooden panel. This system exponentially multiplies the efficacy of traditional vacuum systems; in fact, it uses rigid aspiration modules that create a type of air aspiration tunnel around the painting, allowing us to operate effectively even at a low degree of vacuum: -10 kPa, around 10% of total vacuum. This pressure is uniform throughout the surface of the work. In this way, we can consolidate and line paintings with synthetic resins with excellent qualitative results. Moreover, we can carry out general and localized consolidations using natural consolidants in delicate panel paintings, without unpleasant side effects from the applied pressure, such as denting of the paint layers into gaps in the support or crushed impasto. Schematic drawing of the apparatus and photograph of the vacuum control system. c) Other studies analysed the expansion of consolidants under vacuum and at atmospheric pressure to identify the most effective pressures and to obtain maximal distribution of the natural consolidants (hot glue). 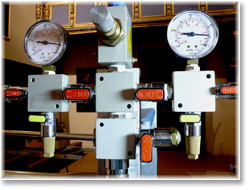 These pressures were between -5 kPa and -10 kPa, around 5% and 10% of total vacuum. In addition, we studied the impermeabilizing behaviour of the synthetic consolidant Plexisol P550 in the treatment of paintings sensitive to humidity. Model of a panel painting (40 x 40 cm). Dispersion of consolidant after injections of 2 ml of blue-stained glue. Under vacuum at the following pressures: (a) –40 kPa, (b) –20 kPa, (c) –10 kPa. At atmospheric pressure (1, 2, 3, 4). 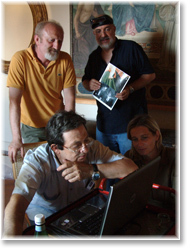 FEATURES: (b) - (c) -M. Verdelli, N. Presenti, M. Goretti, Tecniche avanzate di sottovuoto nel restauro dei dipinti, Edifir-Edizioni Firenze, Firenze, 2007.
d) Creation of new apparatuses for vacuum treatments of paintings exhibited to the public, making removal of the artwork unnecessary. With this equipment, we can work in the presence of gallery visitors who can still view the painting, and we can consolidate the paint layer without removing the final varnish and previous inpaintings. e) Experiments in collaboration with the physics laboratories of the OPD and the Italian NRC to track consolidants injected into the paint layers of panel paintings. We were the first in the field of restoration of moveable paintings to perform radiographic imaging of radio-opaque consolidants and thermographic imaging of consolidants differing in temperature from the surface of the painting; in the latter case, we could literally see the real-time expansion of the liquids under the paint layers. These results are a scientific contribution to research on consolidation techniques, helping to improve such techniques and to clarify the behaviour of natural and synthetic consolidants. Techniques and equipment of our Studio, the NRC and the OPD during the experiments. Localized vacuum consolidation of the paint film, monitored with a thermographic camera. (a) Thermographic image during injection of the hot consolidant under localized vacuum. 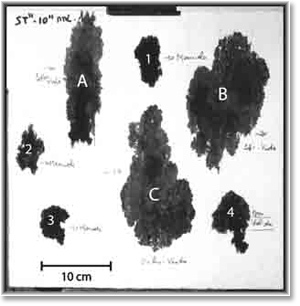 (b) Thermography records the dispersion of the hot consolidant underneath the paint layers. FEATURES: (d) - (e) A. Aldrovandi, N. Presenti, M. Verdelli, Indagini termografiche e sottovuoti localizzati nella conservazione dei dipinti su tavola. Nuove ricerche e risultati. OPD Restauro,18, 2006.